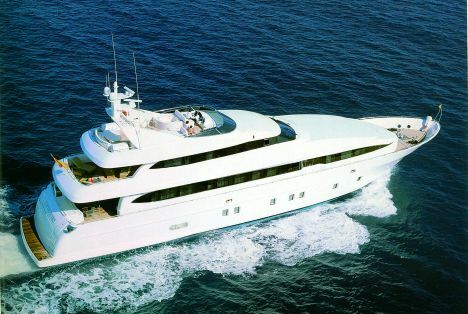 The Spanish yard Astondoa produces an heterogeneous range of boats, from open and fly bridge motoryachts 39 feet long and over to the larger megayachts over 78 feet. The A-122 GLX is a superyacht built in composite materials which comes in the well-known version with two decks and in the other version with three decks and flying bridge described in this article. The guest accommodation area is in the lower deck and includes four cabins with en suite bathrooms, two twins and two doubles, the latter with bed laid transversely across the deck. Forward, adequately separated and with independent access there are the crew quarters with six berths in three separated cabins, bathrooms and a crew dinette. On the main deck forward there is the full-beam VIP suite with double bed in the center of the cabin, en suite bathroom, hanging cabinet and sofa to port. Aft of this cabin there is first the ample fully-fitted kitchen, ideally conceived for preparing banquets and receptions, followed by a day head and a study, adjacent to the ladder connecting the various decks. Proceeding aft there is the ample social area: the dining room with oval table seating 12 and the extremely warm and convivial saloon with opposite sofas. Most of the upper deck is dedicated to the Owner stateroom. This suite is large with bar cabinet, en suite bathroom including bathtub and shower stall and a large panoramic area aft, where the deck becomes a fascinating terrace on the sea. Forward, there is the wheelhouse, with an elegant dashboard fitted with the best state-of-the-art technology. In the central part of the flying bridge there is a pleasant open-air dining area for 12 guests and a long cabinet. Yet, this deck is mainly used for sunbathing with chaise longues and a small rectangular pool. The tender is stored in the aft garage, on the lower deck, accessible from the aft platform as well as from the adjacent engine room. Three MTU engines with an overall power of 6,000 hp propel the yacht at a maximum speed of 30 knots. Declared cruising speed: 26 knots.